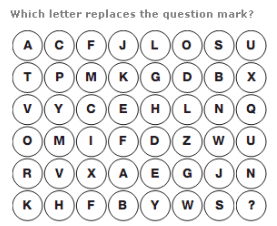 The numerical values of the letters in each row add up to 26 each time. Starting at the top left and moving down, then right one column and up etc in a snakes and ladders pattern, letters move through the alphabet 4 letters at a time. 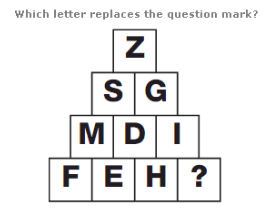 In each row, add the numerical value of the left and right hand letters together and write the letter with the reverse alphabetical value in the centre. 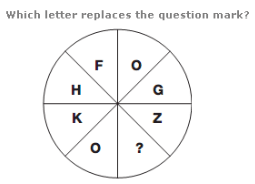 Starting at F and moving anti-clockwise, letters move through the alphabet in steps of 2, 3, 4, 5 etc. 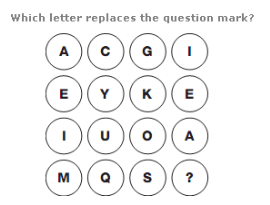 Starting at the top left circle, and moving right, then down one row and moving left, in a snakes and ladders pattern, letters move through the alphabet in steps of 2, 3 and 4, repeating this pattern all the way down.